Answer: Please be informed that the new content is not a separate application, it is a feature of the game that allows you to buy full version of the game from within the app. After you´ve played through the free version you can always go back to the Main Menu of the game to unlock the full version by hitting the "Unlock game" button. You can decide whether you want to unlock the full content or you can play the free version all over again. You don´t need to enter Google Play, you can do it from within the application. New levels will appear in your installed game after you unlock a new content. Just continue playing and you´ll be able to play from the moment you´ve stopped. After successful unlock the "Unlock game" button will disappear in the Main menu. Question: I paid for the game and I had to get a new Android device. Do I have to buy it again? Question: I am trying to purchase the full game but when I tap "buy" it says "request pending" but it hadn't downloaded yet. What am I to do? In spite of our willingness to help, we won´t be able to assist you in such requests since such issues are not connected with our games and are to be resolved by Google Play support specialists. Question: Can I replay a level? Answer: Yes you can replay any level. Go to the Menu with a map and select the state along with the mission to play. Question: How to route a vehicle? Answer: To route a dumpster, add one or more buildings and a recycling center. Recycling center is included automatically when the player starts setting up the route. To route a bus, select at least one bus stop and entertainment center (such as mall or stadium). It works fine to route a bus between several bus stations as well. If you have started routing a vehicle and want to quit it to perform another action, click the red cross in the upper right corner of the screen. Question: What does a spinning hourglass on a truck mean? Answer: This means that the truck is waiting. Most probably this is because the goods are not ready to be delivered. Possibly, there are not enough components to produce a good. When trading with neighboring cities, the waiting sign may mean that there are no goods exported into the other city in return. Question: How do I maximize truck´s income? Answer: Locate the input and output facilities for the truck as close to each other as possible. Upgrading the truck brings in more income, just don’t forget to upgrade the production chain buildings accordingly to the trucks´ level. Question: How do I maximize bus´s income? Answer: Make the distance between bus stops as short as possible. Keep in mind that bigger entertainment centers bring in more income (for instance, transporting citizens to the Theatre makes more profit than transferring them to the mall. Upgrading buses makes sense only if you upgrade the buildings within the bus stops´ area, so that there are more population to use the bus. Question: Do all the buildings have openings on all four sides? Answer: Yes, vehicles can access the building from any side - just make sure the building has a road connected to it. Question: Why can I get no more lumber from the sawmill? Answer: In some levels, it is necessary to replant the trees around the sawmill, in order to continue producing woods, or, alternatively, upgrade the sawmill in order to get more lumber out of each tree. Question: How do tech buildings work? Answer: The broken vehicles within the tech buildings’ area get fixed automatically. Question: Do all buildings need to be connected to the road? Answer: Hospitals, tech stations and fire stations do not need to be connected to the road. Houses must be connected to the road only if they are not within the area of any trash collector. Question: How do I attract more people to my city? Answer: Be sure that your city is environmentally friendly. 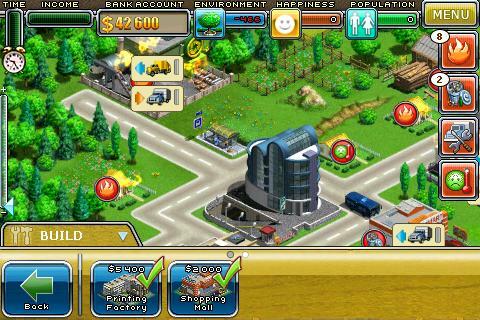 You can increase your environment rating by planting trees, building parks and fountains, upgrading production buildings. Houses with garbage, abandoned houses and dead trees negatively affect the environment. Question: I cannot find necessary buildings available within the "Build" tab. What am I doing wrong? 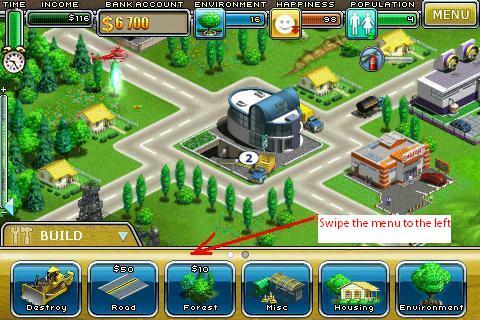 Answer: If you need to construct a factory, a plant, an oil derrick or suchlike buildings, you should tap on the button "Build", swipe the menu to the left and press the option "Magazines", "Pies", "Cosmetics", "Appliance", "Clothes", "Furniture" or "Autos". Please, have a look at screenshots of the Build menu option "Magazines" as an example and the buildings available within it. Question: I don't know how to assign a bus between all Bus Stations in the level Malone, New York state. What am I to do? Answer: There are seven Bus Stations around the map, but the majority of them are surrounded by trees and have no access to the road. You need to destroy trees, build the road and include all Bus Stations into the route of the bus. Make sure all Bus Stations are linked with each other by the road, so that the bus can reach all of them. You can have a look at screenshots of the map to see the location of all Bus Stations and the road between them. Question: I cannot get the necessary product. There is no factory producing it in the Build tab, so I cannot construct it. What should I do in this case? The factory has initially been constructed. Examine the level map more carefully. It may turn out that the factory has already been built and you should only appoint a truck route for the factory to function. Even if you lack some particular resources for delivering raw materials to the factory, there is a probability that there is a stock of ultimate goods in the amount needed for you to complete the aims of the mission. There are trade deals with other cities. Look for green signs of trade routes on your map. Neighboring cities will supply you with the excess of their resources. Question: I cannot raise my income up to the level stated in the goal of the mission. How can I raise my income? Upgrade your trucks. After each upgrade a truck transports one product item more. The more goods the trucks transport the higher income you will get. Use several trucks on one route. Why not? Two 1-star trucks are much cheaper than a 3-star truck, so the goods supplies are more frequent. 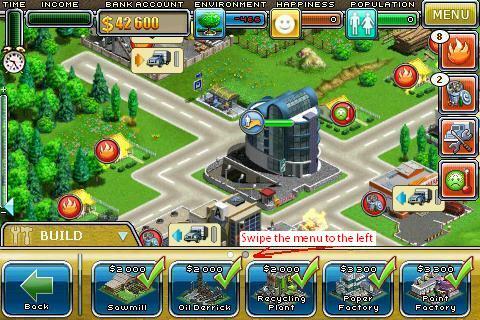 Upgrade your factories in line with your trucks. If the factory is unable to provide your upgraded truck with goods, the upgrade of the latter was useless. 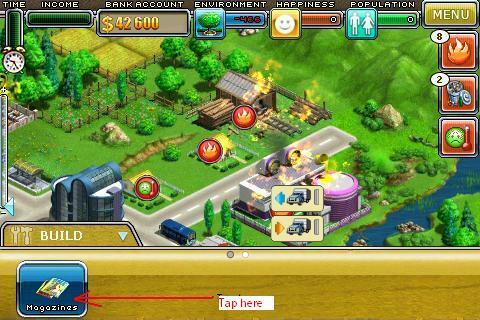 Keep your factories in line with an upgrade of the trucks in order to cover the upgrade expenses in full and to repay them by incomes from the supplies. Optimize the truck routes – watch your Trucks tab! Have a look at the tab of trucks, buses and dumpsters from time to time. Are there any inactive trucks? Have several trucks been waiting for a long time? Perhaps, it makes sense to develop the new production chain or to alter the current one. Don't forget about buses and dumpsters. Buses and dumpsters are a good way to raise your income. The more raw materials a dumpster transports to the Recycling plant, the higher income you will get. The more loaded and frequent people transportations are, the more money you can obtain from your buses. Don't forget that you can involve several dumpsters for the most developed districts. Itis not obligatory to restrict your buses by routing them between entertaining buildings only. If the buses simply transport people from one bus stop to another, they bring profit just the same. Question: I think my truck got stuck at the factory. What should I do? Answer: Make sure the raw materials necessary for obtaining the product are delivered to the factory. A truck will be waiting at the factory till at least one product item appears. In case no raw materials are delivered to the factory, it won't produce any goods, and that's why the truck will be waiting for the load endlessly.